Typhoon Haiyan, which hit the Philippines on November 8th, has killed around 4000, displaced millions more, and left the country in ruin. Donations for rebuilding efforts have poured in from around the globe (totalling over $US 270 million at the time of writing), but experts are warning individuals to make sure that their donations are made through reputable channels. Corruption is rampant in the Philippines, and ensuring that funds actually make it to affected individuals is a major concern. Perhaps tellingly, the day before Haiyan hit the region, the Philippine senate heard testimony from Janet Lim Napoles, who is under investigation for her role in a plot which redirected millions in government funds meant for projects aimed at reducing poverty in the region. Furthermore, it is widely documented that petty corruption among municipal officials has led to lax enforcement of building codes and inspections, resulting in structures unfit to withstand typhoons. 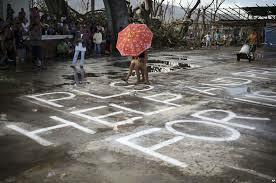 This has undoubtedly magnified the severity of Haiyan’s damage and increased its death toll. The Philippine president Benigno Aquino III is promising measures to increase transparency with regards to relief efforts, but this will prove difficult, as it requires challenging systemic issues among banks, the military, and government officials. Aquino has made it his priority to combat corruption as president, and this disaster is proving to be perhaps the most serious test of that commitment. He has set up a website, the Foreign Aid Transparency Hub, which tracks reputable donations from around the world in order to increase accountability with the funds. The president remains positive about the rebuilding of his country, but admits that he must maintain a steadfast eye on relief efforts to ensure that resources are allocated efficiently and honestly. Many aid agencies are taking steps to ensure that the funds they raise are going to the right people, and some, including the Red Cross, have gone so far as to bypass the Philippine banking system entirely. When dealing with donations in the millions, it is extremely important to track the money’s movement, and unfortunately, most aid providers admit that despite best efforts some leakage of funds is likely to occur. This leakage is minimized when donating to well-established third party charities such as the Red Cross or World Vision, who often have their own supply chains and collect and distribute donations directly. The situation in the Philippines is a stark reminder of the human cost of corruption. In times of need, it is a sad reality that corrupt practices can hinder aid efforts and prevent those who are suffering from getting the assistance they require. Despite measures to combat it, corruption continues to directly impact lives around the world, and it is unfortunate that it takes a tragedy such as Haiyan to bring that fact to the fore.